Many of you write us asking what the inside of our boat looks like. 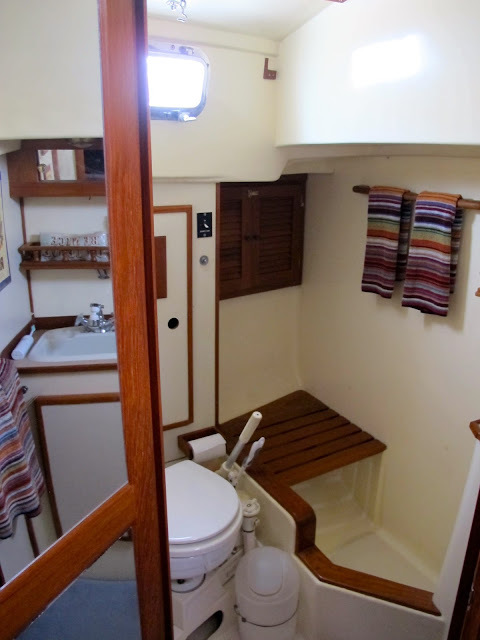 I've got some older pictures posted on our "Boat" page, but - as I mentioned back in the British Virgin Islands - we have been doing some redecorating, so things look a little different. Even still, when living on a boat function must always take precedence over form, so the phrase "interior decorating" is laughable. 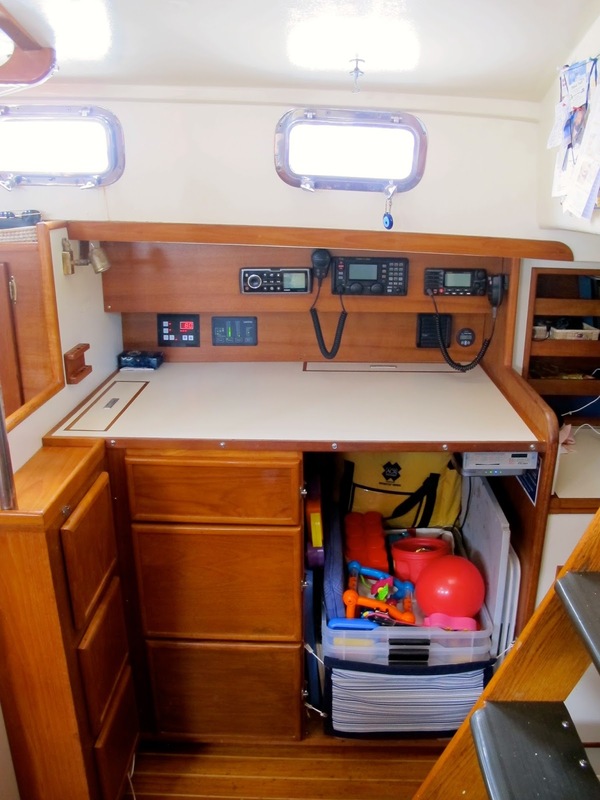 While there are plenty of ways to personalize and get creative, when it comes to a boat's insides, for the most part, what you see is what you get. There's no moving things around or rearranging furniture and your affinity for feng shui will have to fly out the porthole. You must be very mindful of anything frivolous and non-essential that you mount, place or hang, lest they become projectiles on a rough passage. 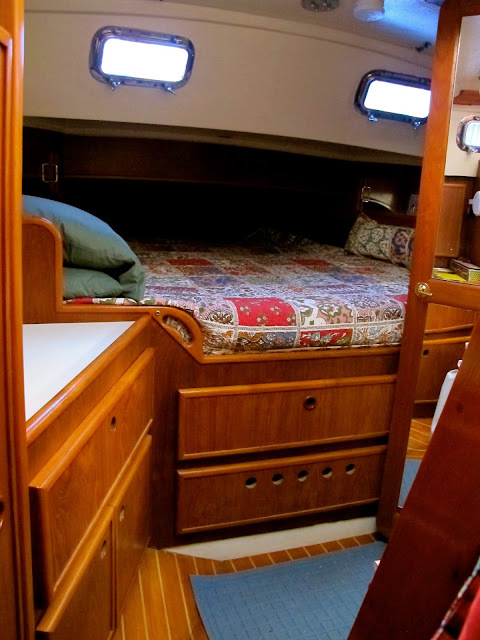 That said, the inside of a boat and how "pretty" it looks should be the least of your concerns when boat shopping, but still - gorgeous interiors have sold more of their fair share of shoddy boats so it goes to show that not everyone is all function out here. Looking forward into the salon from our to our starboard settee which we converted from two seats to one. The same view, port side. We made the custom sink cover/cutting board out of starboard. Extra counter space! 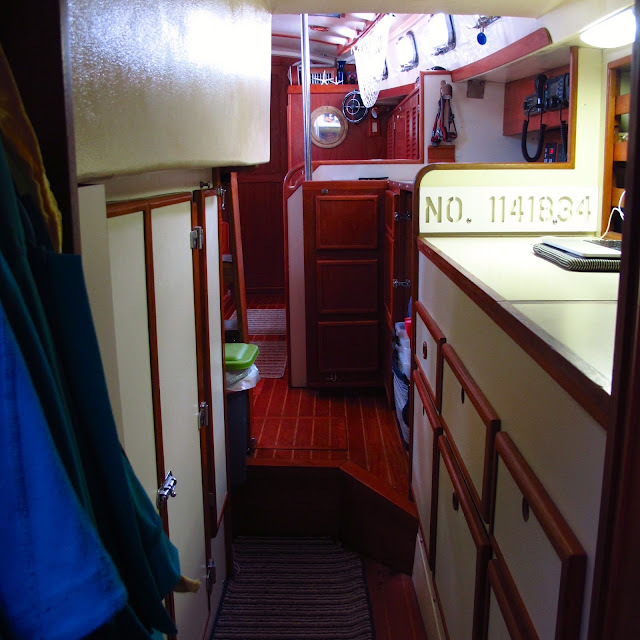 Our walkthrough to the aft cabin. This is where our computers usually live. We keep the shelf behind here very organized and neat with baskets. "A place for everything and everything in its place" is our storage motto. This is looking aft at the expanded view of our walk-through - TONS of storage here. Full engine access is to the right. Looking froward through the walk through from the aft cabin. Note the double doors to engine room. Awesome. Looking aft again from the walk through into our aft cabin. Another view of the aft head - we have old fashioned rum labels mounted on wood on the starboard side - you can only see one but there are four. Very cool and brighten up the bathroom. A view of our main salon as seen emerging from the walk through, companionway stairs to port (left). Our galley. 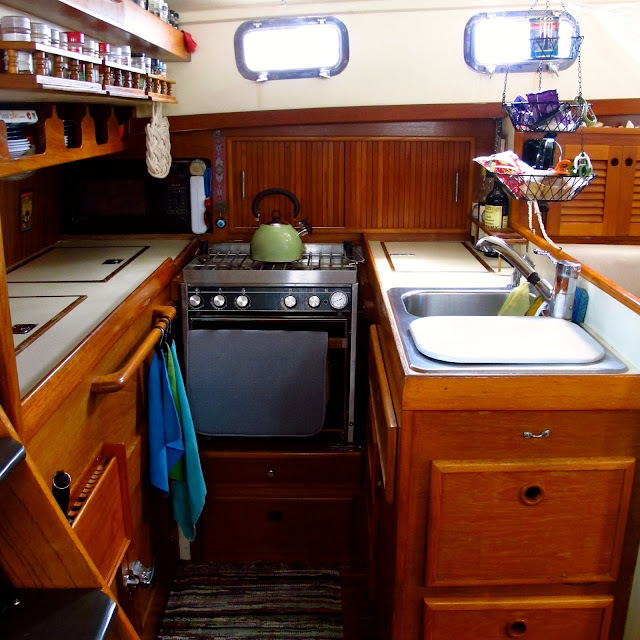 As much as I despise cooking, I love this galley. Huge refrigerator with top and bottom door access as well as a HUGE locker for pots, pans and all the other kitchen equipment I hardly ever use. Our bookshelf got pared down when we both got e-readers. But reference books are best kept in book form in our opinion. Ganesh, the "remover of obstacles" sits contentedly in the middle. Our boat full of Hindu and Buddhist influences, we have three Ganesh's throughout the boat and we're also big fans of the "eye of Rah". Our little Buddha sits happily atop the small desk light in the nav station - thanks to museum putty. The "om" symbol is affixed to the door of Isla's room. It carries with it a lot of meaning and symbolism, but suffice it to say it embodies the "essence of the entire universe"
Isla's room. The one place where clutter reigns. She loves her little area and we are firm believers that while you CAN have too many toys, you can never have too many books! The forward "guest" head. Very light and roomy. Again with tons of storage. A full length mirror is on the left. This is what I remind myself of always. It is hanging in our forward head. Very nice! Do You have vacuum cleaner or use sweep and mop? Only a small one for bread crumbs? (I hate vacuuming). What is the material of the sofas? (ballpoint pens seem good to keep clear of those and Isla!) White gives light. Love it! Literally the first thing I moved onto Que Tal after we bought her was a bunch of photos in plastic frames that I put up with poster putty to make the boat "ours." I totally get the need for a nice, uncluttered space and perfectly understand that it can be tiny and inexpensive, as well. Yours is lovely, great job! One thing that caught my eye, though, is that your laptop seems to be sitting on a cushion of some kind. That is not a good thing to do, as it can restrict the airflow from the fans and cause overheating - which can kill your laptop. You should try to avoid placing it on soft surfaces for extended periods of time whenever possible. Everything else looked wonderful, though. I can certainly see why Isla loves her space, what a wonderful area for a child her age. And what a fabulous way to spend her earliest years. Even though she will probably not remember much of it up to this point, except for photos, they are certainly contributing to her development in the most awesome way. We Love it. Very nice and cozy. We too agreed to have nothing of a nautical themed décor aboard Cream Puff. Personal artifacts with fond memories attached is the way to go. You have very nice taste. Thanks for sharing your personal space. Next, I just wrote an article for SAIL Magazine about interior decorating on a boat. It hits the stands Sept 3 (in their new Multihull mag). 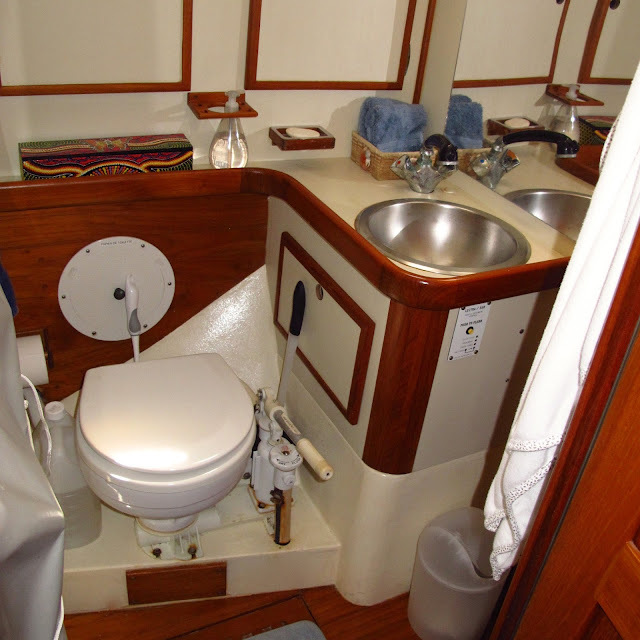 One of the major points I make is that using nautical themed decor on a boat is a DON'T! Hey There! Can you confirm the official headroom throughout your Brewer? 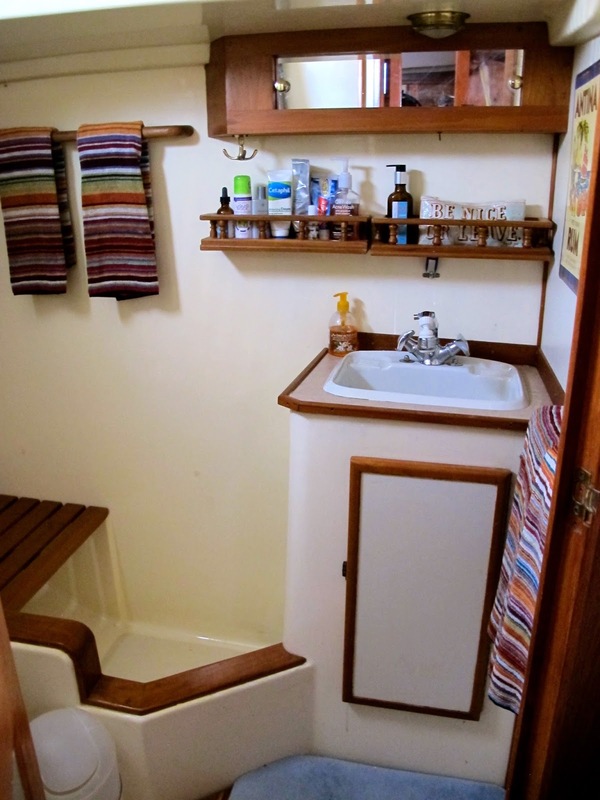 I am 6'4" and on the market for a boat, however, my broker has mentioned that Brewer 44 is not very generous on the headroom. 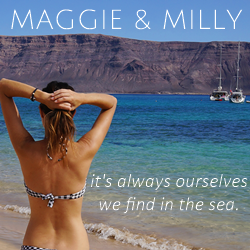 Thanks for all your great blog work and sharing your life story! Oh... such a lovely interior! I so enjoy your blog. 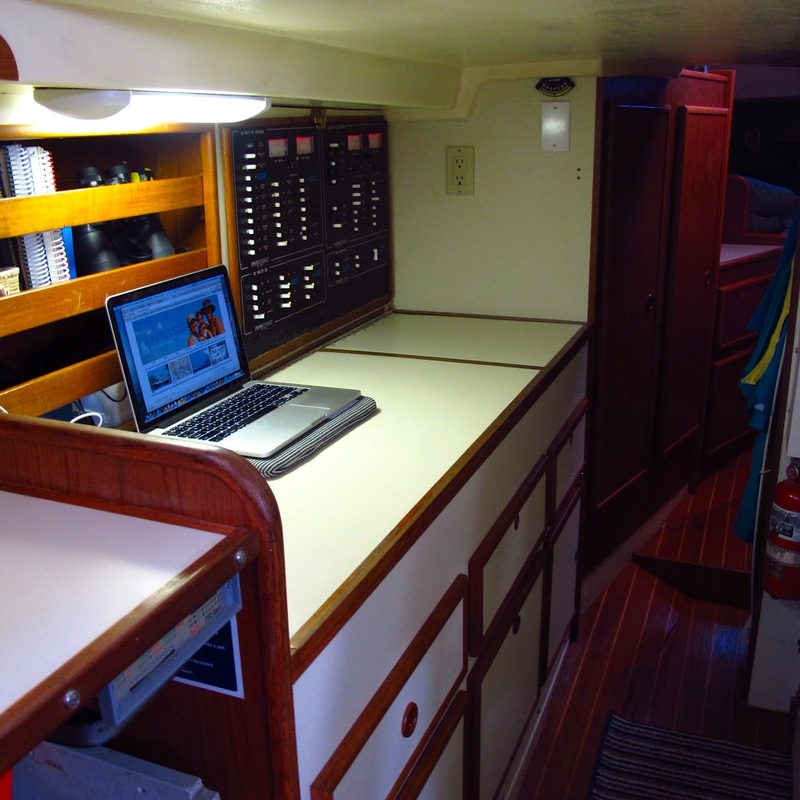 We hope to one day soon join the live aboard club. 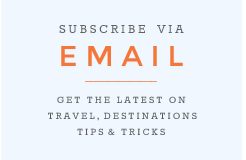 Your blogs are both instructive and personal. I like the mix. 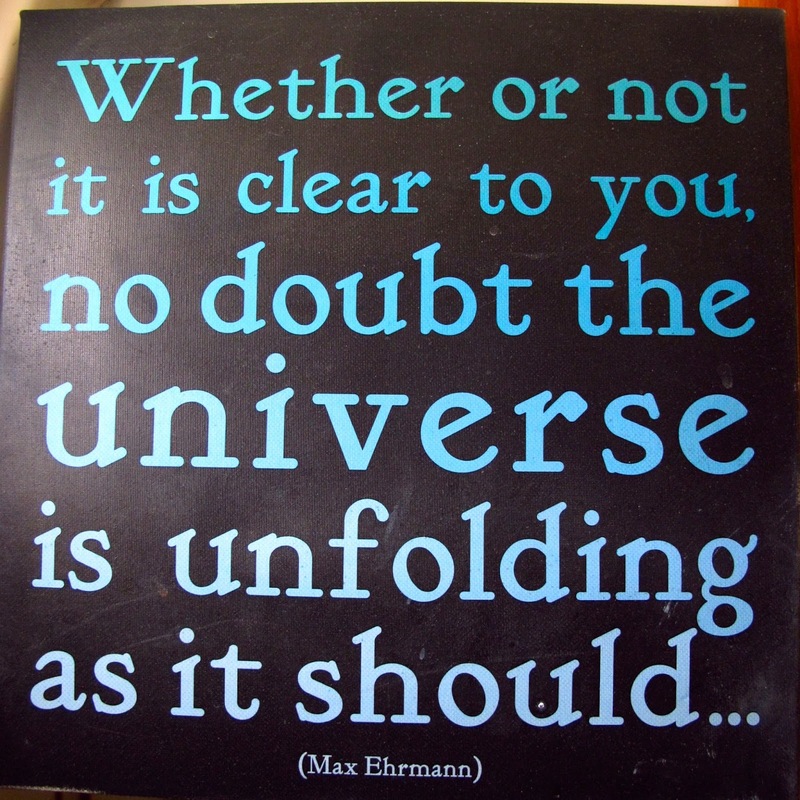 For those of us new to sailing but with dreams of making our on experiences, hearing the ups and downs, negatives and positives helps keep the dream based in reality. No crazy belief that we can run from every problem to a fantasy land. Thanks for not letting that be all you share. So sorry Isla has been sick. Hope she stays on the mend. One question on your boat decorating . I did not see curtains, do you not need them to help cool or darken the cabin? Love this. 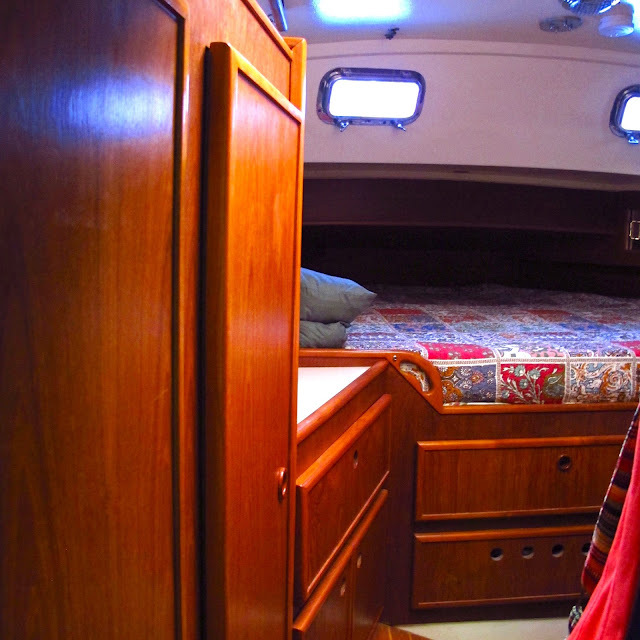 Stepping on a boat and seeing how it has been made into a home- or not- speaks volumes to me. I'd love to know what you used on the settees. We'll redo ours soon, I'd love to use a very light color but was concerned about them getting marked up/dirty from the kids. You must have something bombproof for Isla! Please share. Decorating a boat definitely makes it more homey. You did a really great job doing it. I'm loving how you've decorated your boat! Everything looks extremely cozy and has a real sense of "home". Hoping to get ours decorated and feeling like home soon too. I do though have a question for you, that I am hoping you can answer for me. In the very first photo that you have posted here, I see you have glass balls hanging from the mast. Pardon my ignorance, but can you tell me the name of what those glass balls are called? As many times as I have seen them, I have never known what they are called and I would really like to search for some online to buy for our boat. I have googled several different key words in hopes to find out what their name with no luck. So I am hoping you can help me with this simple request. Lastly, I just want to say thank you for being so open and sharing your life adventures and stories on your blog. I have learned an incredible amount from your posts and look forward to following your family in all future posts to come! I'll be eagerly awaiting your reply, as I'm really looking forward to adding this little bit of décor to our boat as well! We just bought our first sailboat yesterday and it needs some "sprucing up". Naturally, I turned to the internet for ideas/tips/etc. and stumbled upon your blog. 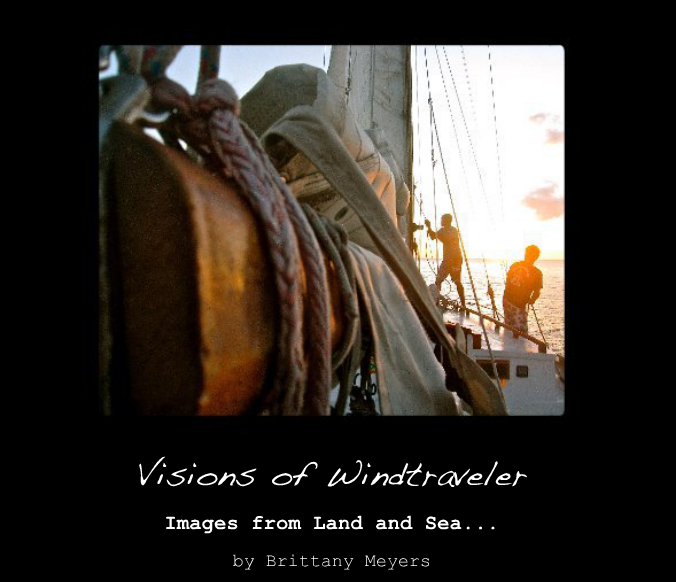 I really love everything (and am fascinated by the fact that you sail with 3 wee ones!). I was wondering where you found your "cheap non-skid rugs". Our boat currently has some carpet remnants along the bottom that I'm not to fond of. It really an art and your boat is stunning! Thanks for the sailing inspiration!